How to find the p-value? What is the p-value formula? This p-value calculator is a tool that can help you determine the p-value in the standard normal distribution. It is defined as the probability of obtaining a result equal or more "extreme" than the observed one. Read on to learn how to find the p-value and what is the p-value formula. Normal distribution, also known as the Gaussian distribution, is a continuous probability distribution. It is often used in natural and social sciences. A variant of normal distribution is the standard normal distribution. It is a special case, in which the mean of all values is equal to 0, and the standard deviation to 1. The total area under the probability density function is also equal to 1. Hence, the area under this graph between any two x-values is equivalent to probability of the experimental result being in this given range. P-value is the probability that a result will be equal or more extreme that the observed one. As probability is equivalent to the area under the graph, p-value is the area under the probability density function to the right of the observed value. In standard normal distribution, instead of using the value itself, you need to standarize it by calculating the z-score. It is defined as the number of standard deviations by which a data point is above the mean. If you want to calculate the p-value, you have to find the integral with lower limit equal to the z-score and upper limit equal to infinity. 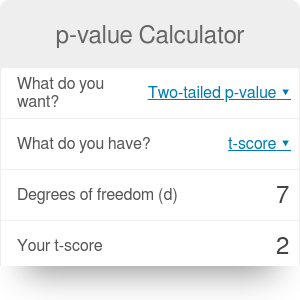 The easiest way to find the p-value, though, is to use our p-value calculator. Simply type in the value of the z-score and you will have the p-value calculated in no time! Right-tailed p-value (Z > z): the area under the probability density graph to the right of your z-score. This is the p-value "by definition". Left-tailed p-value (Z < z): the area under the probability density graph to the left of your z-score. It is equal to the difference between 1 and the right-tailed p-value. Two-tailed p-value: the area under the probability density graph to the right of your z-score, and to the left of the number opposite to your z-score. Two-tailed confidence level: the area between your z-score and the opposite to this z-score. P-value Calculator can be embedded on your website to enrich the content you wrote and make it easier for your visitors to understand your message.